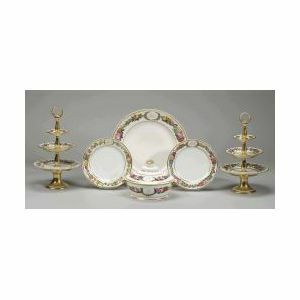 Assembled Paris Porcelain Partial Dinner Service, all enamel decorated with foliate rim, comprising twelve luncheon plates with floral specimens to center (dia. 9), three plates with monogram (dia. 9 1/2), round platter with monogram (dia. 14 3/4), covered tureen with monogram (dia. 8 1/2), and a pair of three tiered servers, ht. 15 in., (19 pieces total).